Terrorism and neoliberalism are connected in multiple, complex, and often camouflaged ways. This book offers a critical exploration of some of the intersections between the two, drawing on a wide range of case studies from the United States, United Kingdom, Brazil, and the European Union. 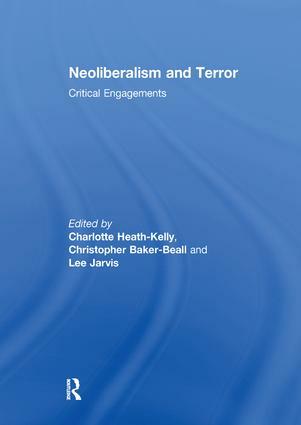 Contributors to the book investigate the impact of neoliberal technologies and intellectual paradigms upon contemporary counterterrorism – where the neoliberal era frames counter-terrorism within an endless war against political uncertainty. Others resist the notion that a separation ever existed between neoliberalism and counter-terrorism. These contributions explore how counterterrorism is already itself an exercise of neoliberalism which practices a form of ‘Class War on Terror’. Finally, other contributors investigate the representation of terrorism within contemporary cultural products such as video games, in order to explore the perpetuation of neoliberal and statist agendas. In doing all of this, the book situates post-9/11 counter-terrorism discourse and practice within much-needed historical contexts, including the evolution of capitalism and the state. Neoliberalism and Terror will be of great interest to readers within the fields of International Relations, Security Studies, Terrorism Studies, and beyond. This book was originally published as a special issue of Critical Studies on Terrorism. Charlotte Heath-Kelly holds concurrent postdoctoral fellowships at the Institute of Advanced Study and the Department of Politics and International Studies at the University of Warwick, UK. She is the author of Politics of Violence: Militancy, International Politics, Killing in the Name (Routledge, 2013), and the co-editor of Counter-Radicalisation: Critical Perspectives (Routledge, 2015). Her current research will be published in 2016 as Death and Security (Manchester UP). Christopher Baker-Beall is a Lecturer in International Relations at Nottingham Trent University, UK. He is the (co-)author or editor of two books on the politics of terrorism, counter-terrorism, and security, including Counter-Radicalisation: Critical Perspectives (Routledge, 2015) and The European Union’s ‘Fight against Terrorism’: Discourse, Policies, Identity (Manchester UP). Lee Jarvis is Senior Lecturer in International Security at the University of East Anglia. He is (co-) author or editor of eight books on the politics of terrorism, counter-terrorism and security including Anti-terrorism, Citizenship and Security (Manchester UP, 2015) and Critical Perspectives on Counter-terrorism (Routledge, 2014).